When shopping, it is important for students to be able to spend their money wisely and choose the item that costs less. After my students are able to find items on their grocery list, I like to challenge them to look at the prices and pick the brand that is cheaper. 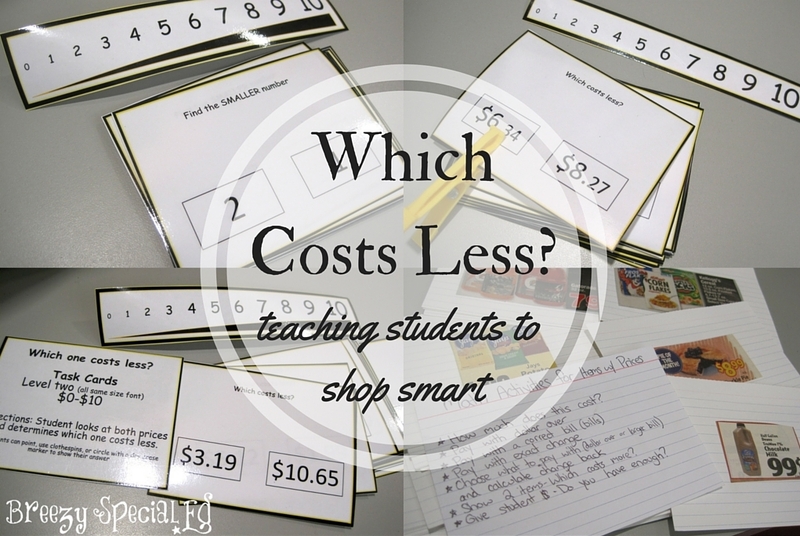 When teaching students to determine which item costs less, I follow a three step process to help them learn this important skill. First, we work on choosing a smaller number. I may start off by writing two numbers on a white board and make the smaller number physically smaller (so a "2" would be written smaller than a "7") if the student is new to this concept. I try to quickly move onto the next step, with both numbers the same size, but giving the student a number line to help them if they need it. I have a variety of number lines in my classroom that I would use depending on my student's needs. Some are basic, with 0-10 in a line, others the numbers gradually get bigger, among other visual supports. Next, I move to numbers as prices, including both dollars and cents. This can be tricky because it adds a lot of different numbers. I teach my student to only focus on the number before the decimal point, the dollar amount. To help them do that, I keep the cents smaller at first so it is easier for the students to learn to focus on the dollar amount and figure out which one costs less based on the dollar amounts. I continue to use number line support during this level if needed. 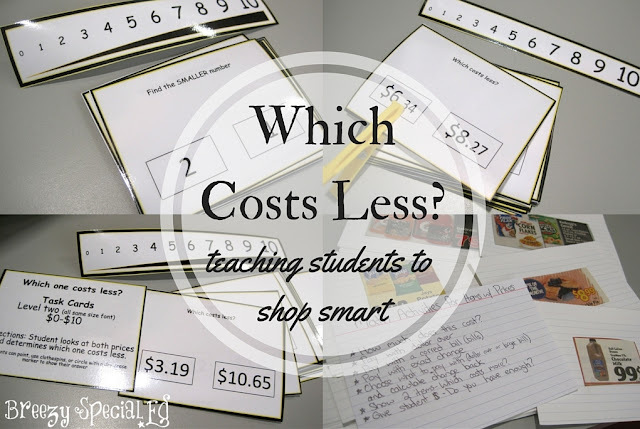 Then, when a student has learned to focus on the dollar amount of prices and not the cents, we work on determining which one costs less when all of the numbers are the same size. Once students are able to complete this last level, I like to continue to challenge them further! I cut out a bunch of items with prices in grocery ads and glued them onto index cards. 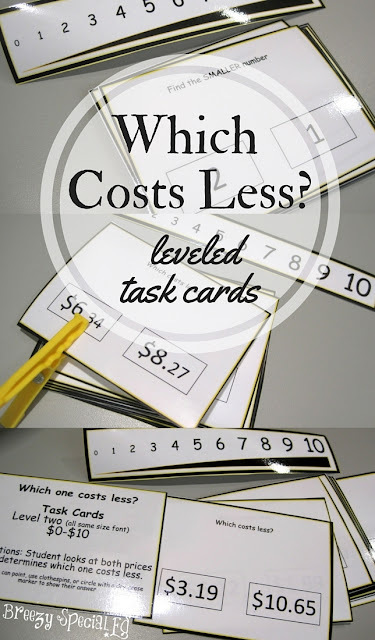 I can then give a student two cards and have them tell me which one costs less. There are a ton of different activities I do with these cards as written in the picture above! Love the visual with the number line! Why have I never thought of that? I've taught life skills for 5 years at the 5th/6th grade level. I'll be moving to high school in the fall. Love your blog! So many great ideas.